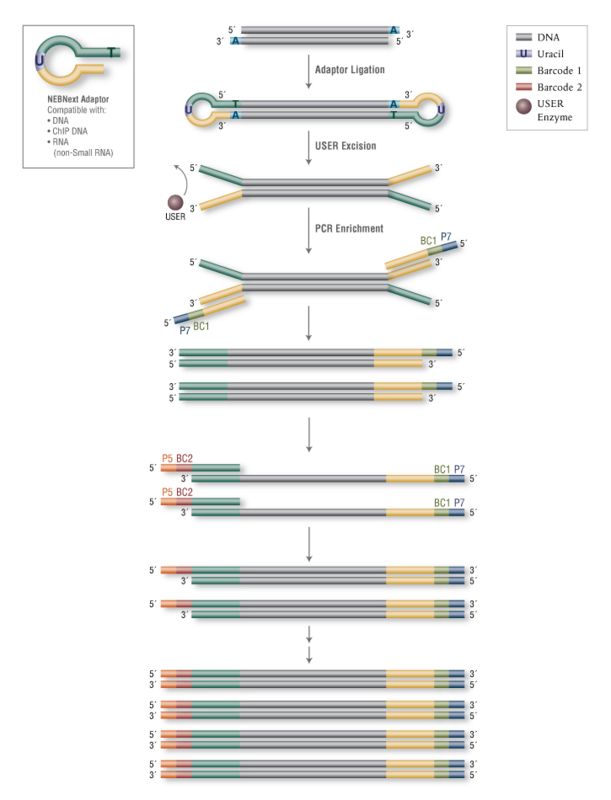 Incorporating a novel hairpin loop structure, the NEBNext® Adaptor ligates with increased efficiency to end-repaired, dA-tailed DNA. The loop contains a U, which is removed by treatment with USER™ Enzyme (a mix of UDG and Endo VIII), to open up the loop and make it available as a substrate for PCR. During PCR, barcodes can be incorporated by use of the NEBNext index primers, thereby enabling multiplexing. This kit includes 8 i5 index primers and 12 i7 index primers. Single primer options are also available, in 12- and 96- index formats (NEB #E7335, NEB #E7500, NEB #E7710, NEB #E7730, NEB #E6609). A methylated version of the NEBNext Adaptor is also available for use with bisulfite sequencing protocols (NEB #E7535). Do you have Sample Sheets for use with the NEBNext® Multiplex Oligos for Illumina® (Dual Index Primers Set 1)? Do NEBNext Multiplex Oligos for Illumina (Dual Index Primers Set 1)come with library prep reagents? Can I use NEBNext Multiplex Oligos for Illumina (Dual Index Primers Set 1) for library prep from both DNA and RNA samples? How many libraries can I prepare with the NEBNext Multiplex Oligos for Illumina (Dual Index Primers Set 1)?